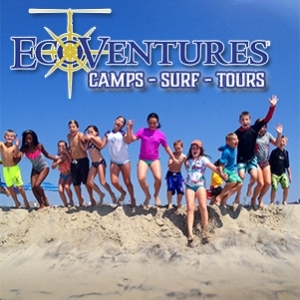 Now registering for Surf Lessons & Ecoventures Summer Adventure Programs! Whether you live in the Cape May County area or you're visiting the shore on vacation, EcoVentures offers daily outdoor activities for kids, ages 5-13. Programs take place from 10am to 4pm, Monday-Friday at participating hotels and resorts, and give children the opportunity to experience beachside activities like surfing, skimboarding, snorkeling, and more, all while learning about marine biology and the environment. Using our hands-on approach to teach nature-based adventure activities, our dedicated instructors harness childrens' curiosity and investigative minds to inspire them while having the time of their lives. We incorporate environmental education into every aspect of our programs: children learn about tidal movements and waves during skim and bodyboarding lessons; identify fish and shellfish species, as well as their local significance, while snorkeling; and learn about beach erosion and dynamic food webs while on beach walks. These programs are the perfect opportunity for everyone in the whole family to enjoy their summer vacation. While the kids are busy at EcoVentures snorkeling, bodyboarding, and having a blast with other children, parents are free to enjoy a peaceful day of their own! 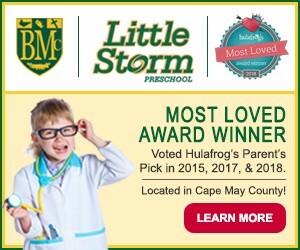 When you're looking for the perfect kid's activities or things to do in Cape May, EcoVentures has something for everyone! Throughout the week's programs, instructors will lead activities that vary each day and include a deep-sea fishing trip each Friday. Click on the program locations below for more details about the camp location closest to you. All EcoVentures program instructors are CPR/First Aid certified and have a true passion for sharing their love of the ocean, environment, and nature with a young audience. Because we like to give each child plenty of attention and instruction, EcoVentures Adventure Programs have a very low instructor-to-child ratio and small group sizes. You do not need to be staying at the hotel to participate. Pre-registration is encouraged as programs fill up fast. Sign up and reserve your space today!